“Reach for the Sky”, “Aim High”, “The Sky is the Limit”. All of these well known sayings must have run through the mind of a little girl in Ipswich over a century ago. Ipswich girl Edith Cook, became the first female pilot in the country. Edith was born in Fore Street in 1878, a poor part of town close to the dock and potteries. Her father was a baker and confectioner at number 90. 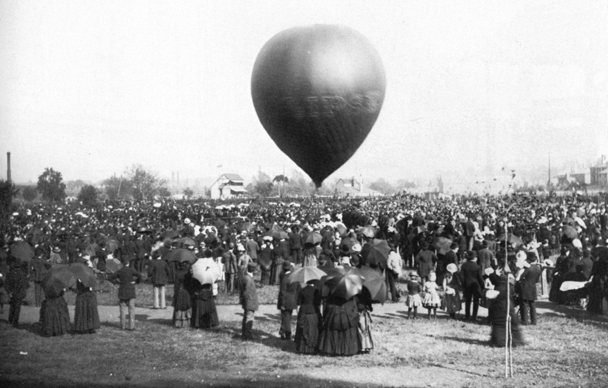 The chance to escape the fate of many young girls, whose only career hope was to enter domestic service or work in a local clothing or cigarette factory, was possibly inspired by a balloon assent in Ipswich in 1888 when Edith was nine-years-old. Around 1900 Edith wrote to balloonists the Spencer Brothers asking if she could become a parachutist, then a very dangerous occupation, which meant holding onto a trapeze bar under a parachute, which was attached to a gas balloon. After being lifted to a height of up to 4000 feet the parachute was released for the decent. Edith worked for the Spencer Brothers under the name of Miss Viola Spencer and made over 300 descents over the next ten years all over Britain and Europe. Edith wanted to become an aeroplane pilot and in early 1910 became the first woman to fly solo in a Bleriot aircraft at Claude Graham-Whites aviation school at Pau near the French Pyrenees. Her flight pre-dated that of Hilda Hewlett who entered the record book as the first woman to obtain a pilot’s licence on August 29, 1911, at Brooklands racetrack and airfield in Surrey. Edith made several flights at shows under another pseudonym as ‘Miss Spencer Kavanagh, the famous Aviatrix’. Edith would probably have become the first female pilot with a licence, giving her a greater place in aviation history if tragedy had not struck on Saturday, July 9, 1910, when she made a parachute decent over Coventry and the wind blew her onto a factory roof. Edith fell from the roof breaking her pelvis and elbow. After an operation Edith died from her injuries on July 14, 1910. She was then just 30. An inquest into her death heard that she told her surgeon that she enjoyed her dangerous work. She said she did not know what to be nervous was and was absolutely fearless. Her late father disapproved of her work, which was unknown to most of the customers of his tiny bakers shop in Fore Street as she worked under different names.